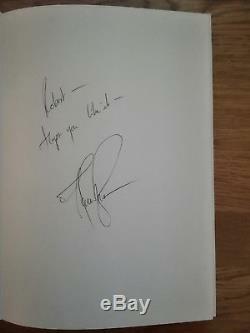 Hand Signed by Derren ('Robert - Hope you like it'). A Superb Gift for any Budding Magician! Derren Brown is world renowned as one of the greatest mentalists alive today. Recently predicting the outcome of the national lottery live on national TV. Here is your chance to own one of his foremost publications, now sadly out of print and getting harder to find, a hand signed photo and a chance to win the national lottery at the same time! 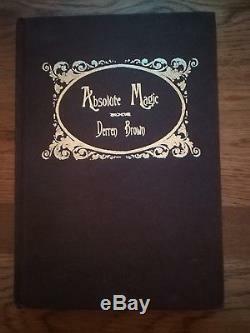 ABSOLUTE MAGIC BY DERREN BROWN -1st Edition (Brown). A Rare chance to get a copy of this out of print book!! Following the success of Pure Effect, Derren Brown offers a detailed study of the most difficult task facing any close-up magician: how to make magic convincing. This is a rich and witty journey through the thinking of Britain's foremost current magical performer, whose television specials have revolutionised mentalism and drawn massive viewing figures. Absolute Magic offers the profoundest thinking, expressed in the most memorable and vivid prose, and is a necessary modern classic for the magician or mentalist striving to make his performances more powerful. This is a manifesto for performing excellence, not a mere collection of routines. But those who study it carefully will find much practical information, not only on close up magic (Derren's emotion packed presentation for the floating ring, for example) and mentalism, but also Derren's unique approach to theatrical pick-pocketing. 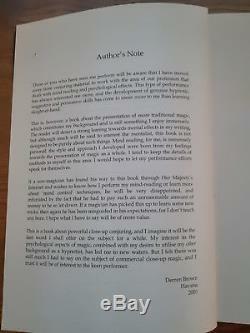 Originally privately published by the author, Absolute Magic, was only available directly from Derren via his password protected website. Those fortunate few who were able to negotiate the website and place their order have cherished their copies. With his performing career no longer affording him the luxury of filling orders, he has authorized its publication and distribution by H & R Magic Books. We are pleased to announce that the book is now available. If the author's previous book, Pure Effect, was a challenge to the status quo of close-up magic, then Absolute Magic is an outright call to arms he wants not only to alter the way we do our art and work, but he wants to transform the way we think and feel about it... Mr, Brown also possesses considerable experience with pick-pocketing, a subject he explores in some technical as well as theatrical depth. There is some excellent instruction here this is some of the most pragmatic contents of the book, which still serves as a vehicle for Mr. Brown's thoughtful consideration of artistic issues. Jamy Ian Swiss in Genii Magazine March 2000. Here is an excerpt from the book, cited in the Genii review, as characteristic of its contents. Have the courage to think from this starting-point, and to leave ninety percent of your repertoire behind you. Then go out to perform fresh and eager to improve even more, and from the moment you arrive, invent and walk your own prestige. Carry it around with you with the quiet nature of the man confident in his authority. Communicate it thoroughly and subtly before any magic begins. You are not a juggler, nor a mere amuser of the middle-classes: you are a magician. The main task of that wonderful job is to lift people out of themselves. You are a connection to a wondrous world, and if you forget that and just become a mingling trickster, then you are undercutting yourself, and denying yourself the shiver of an unrivalled type of job satisfaction. In keeping with our model, it is vital that you transport people: that in some sensitive way you challenge the comfort of the social context. In places where the posh gather and talk about silly things, you must gradually, softly, sound a bass note that rumbles. You act with caution, and you pace the mood of the event (and you don't cloud that judgment by swigging too much of the Champagne yourself), but you remember that you are there to create magic and you bide your time. Warning: This is not a book for the casual reader nor one who is easily offended! Rare First (Brown Coloured) Collectors Edition. Hand Signed -'Robert - Hope you like it. A Superb Book this would make an excellent gift for any magician. A wealth of magical entertainment. 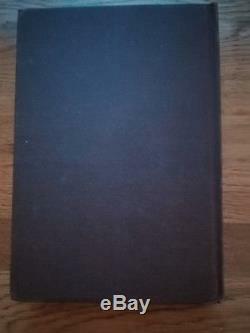 The item "Derren Brown Absolute Magic 1st Edition Hand Signed! Incredibly Rare Book" is in sale since Sunday, July 8, 2018. 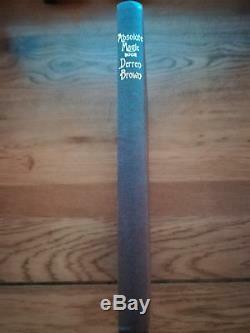 This item is in the category "Collectables\Fantasy, Myth & Magic\Magic\Tricks".